The Next-Generation RIB is powered by a single waterjet and inboard diesel engine installed below the entirely clear and flat aft deck. By careful design we have been able to achieve the installation without an engine box or any other upstand that would reduce the capability and flexibility of the craft as well as form a trip hazard to personnel. The result is a large, flexible and safe payload deck that can accommodate multiple crew seats, equipment modules, fire-fighting and salvage equipment, or survivors in stretchers. The deck is even large enough for an ATV to be carried and driven on and off via the stern ramp. Seats and payload items are secured to the deck track system which is integrated into the aft deck. The design features an entirely infused composite structure for a high quality, damage resistant and light weight structure. 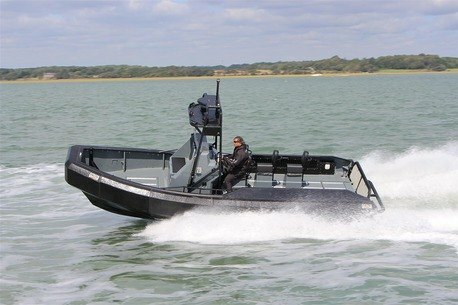 The design is flexible and can be built at a range of boat lengths, with a range of propulsion options, and with a bow ramp if required. We believe this to be the most flexible and capable RIB design available in this size range. For further details please contact Vectis Marine Design or Delta Power Group.